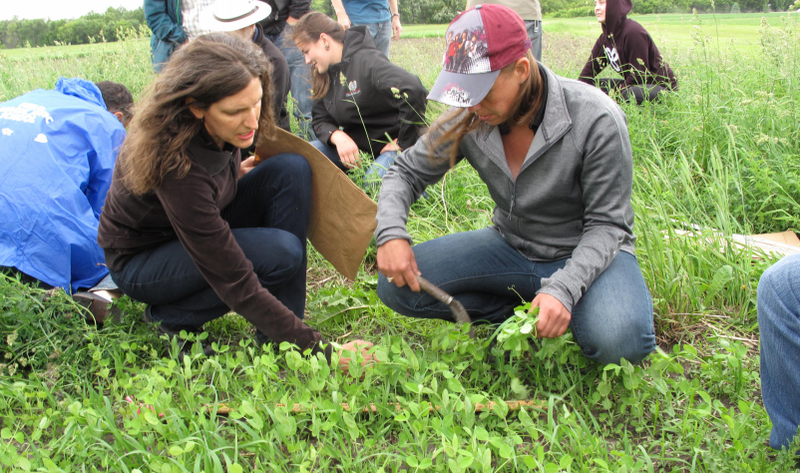 Research technician Joanne Thiessen Martens (left), University of Manitoba, working with agronomists at a training. It can all be a tall order for farmers who are already hard-pressed for time. Meanwhile, the crop advisers whom farmers rely on may not know how best to assist organic producers. For these reasons, Entz’s University of Manitoba team joined with the Prairie Organic Grain Initiative in Edmonton, AB, to launch an Organic Agronomy Training Program last year. Their goal: to help professional agronomists and their burgeoning clientele of organic producers be more successful and productive. The partnership offers annual, in-person trainings and follow-up support to agronomists in Canada’s three Prairie Provinces: Manitoba, Saskatchewan, and Alberta. More than 120 people, including Kostuik, are now enrolled. The first trainings in 2016 covered the basics, says Katherine Stanley, the program’s manager, such as what organic agriculture is and how its approach differs from conventional farming. Over time, though, it has homed in on two issues. “Weeds and soil fertility are definitely the two big areas we work on with farmers and crop advisers,” Stanley says. 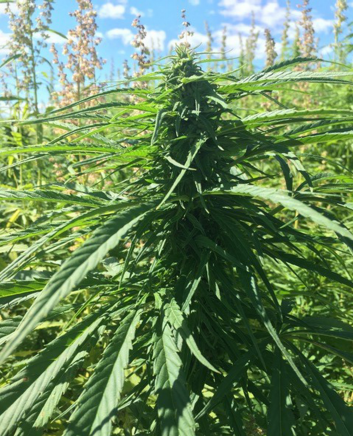 On this front, he and Hemp Genetics’ new organic hemp specialist, Alden Braul, have been studying organic nutrient supplements and crop rotations that will support hemp’s appetite. Most critically, this includes growing faba beans or another nitrogen-fixer, plowing it down, and then sowing hemp the following year. Lately, too, they’ve been under-seeding hemp with sweet clover to give hemp a nitrogen boost during the growing season. While a flourishing hemp crop is a terrific weed fighter, though, it creates another issue: managing the leftover residue. When hemp is harvested for grain, only the tops of the heads are clipped off, Kostuik explains, leaving behind 4 to 6 ft of plant—and eventually 1.5 to 2 ft of residue. That residue doesn’t break down easily, and the region’s growers often resort to burning it. Organic industrial hemp. Photo courtesy of Hemp Genetics International. Inter-row cultivator in wheat. Photo courtesy of Washington State University Extension’s Wheat and Small Grains website (http://smallgrains.wsu.edu). In her work in the Organic Agronomy Training Program at the University of Manitoba, Katherine Stanley talks a lot with agronomists about the need for careful planning. And then, there is the backup planning. “Organic farming requires a different way of thinking, a different way of diagnosing problems and creating solutions. And often those solutions require backup solutions,” she says with a laugh. In few areas is this more apparent than weed control. 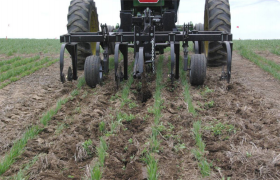 Traditional tillage tools—while very effective against weeds—can only be used during a limited time period in the spring; otherwise, they damage the crop too much. To give organic farmers more options, Stanley and her colleagues routinely investigate alternatives. “In our region, weather is becoming more unpredictable, so farmers want more flexibility in their farming systems,” she says. As organic farming becomes more profitable, farmers are also more willing to invest in new technology, she adds. One such technology is the inter-row cultivator. Originally developed for wide row crops like soybeans but modified now for lentils and cereals grown in narrower rows, these cultivators never actually touch the crop, giving farmers a wider window in which to use them. Another advantage is that they’re considered minimum tillage because they don’t turn the soil over completely. Many new cultivators from Europe also have camera-guidance that keeps the cultivator properly positioned in the crop row. “This allows the farmer to go a bit quicker and with increased accuracy,” Stanley says. The new technology she’s most intrigued by, though, is the comb-cut, a mechanical tool that avoids tillage altogether. As the comb-cut travels a field, its blades are positioned to let the flexible stems of crop plants slip through, while whacking off the seed-producing heads of rigid weeds, such as Canada thistle. This helps shrink the weed seed bank the following year. It may also boost crop yields— something Stanley will be investigating. Meanwhile, CCA Elizabeth Karpinchick and her colleagues at Tone Ag Consulting in St-Pierre-Jolys, MB are helping organic farmers expand their weed-fighting strategies beyond mechanical means. One thing they’re examining this year is the timing of seeding. If a farmer knows he gets two big flushes of weeds in the spring, for example, he should delay seeding until afterward. Or, if fields are plagued by late-season, grassy weeds—as are those of one of Tone Ag’s organic clients—he should try seeding early to get the crop well established before the weeds emerge, Karpinchick says. What makes this strategy work is in-depth knowledge of a field’s weeds and their growth patterns; Karpinchick suggests scouting for weeds both in spring before the crop is up and in fall after harvest “to get the lay of the land” without the crop in the way. Here, under-seeding with sweet clover may also help. Braul and Kostuik are investigating a method of processing the clover and hemp residue with a silage machine and then blowing the material back on the soil. “That way we’re maintaining the nutrients, getting rid of the fiber, and building the soil, as opposed to taking away from it, which has been on our minds,” Kostuik says. Nitrogen and phosphorus are the top two nutrient concerns for the region’s organic growers in general, Stanley adds. Still, one of them consumes considerably more of people’s time and energy. “Solving a nitrogen problem tends to be a bit easier because we can use crop rotation and add legumes. With proper planning, you can usually address any nitrogen issue,” she says. But managing phosphorus “takes more of a change in thinking,” because good sources of phosphorus are harder to come by. Above: Sweet clover. 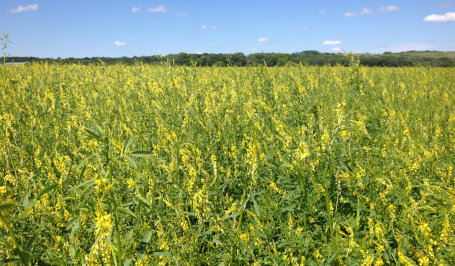 Jeff Kostuik and Alden Braul of Hemp Genetics International have been underseeding hemp with sweet clover to give hemp a nitrogen boost during the growing season. The Prairie Provinces are home to some 12 million beef cattle, and pigs are also plentiful in certain parts, making manure a preferred phosphorus source of organic producers. Yet while many prefer it, it’s not necessarily easy for them to obtain. Some growers can get manure from their neighbors, but others must ship it to their farms from a distance, often at great expense. Still others have ready access to manure but not to equipment for spreading it. Even those who own livestock can face challenges, says Elizabeth Karpinchick, a CCA with Tone Ag Consulting in St-Pierre-Jolys, MB, who is also participating in the Organic Agronomy Training Program. One organic dairy producer she works with, for example, can supply only part of his farm with manure from his cattle. “Half of it doesn’t [have manure], half of it does, so we’re going to need two totally different management strategies,” she says. Other options include fertilizing with rock phosphate, fish or algae solutions, or commercial phosphorus products approved for organic production. But how to add phosphorus isn’t the only question. Figuring out when to add it is also crucial. Joanne Thiessen Martens, a research technician with Entz’s group, understands this well. From 10 years of interacting with organic farmers, she knows how hard it can be to diagnose a phosphorus deficiency in the first place, not to mention deciding what to do about it. To remove some of this uncertainty, she started working a few years ago on a diagnostic tool tailored to organic conditions. The key to understanding it is appreciating how it differs from standard soil testing. Traditional tests forecast how much phosphorus will be available to the crop in the upcoming season, she explains. “Or put another way, what the soil has up for offer, as a starting offer, to plants.” Her test, in contrast, measures how much phosphorus plants actually extracted from the soil during growth, as indicated by an assay of plant nutrient concentrations at season’s end. It also accounts for situations, seen frequently in organic fields, where soil test phosphorus is low but crops still do well. 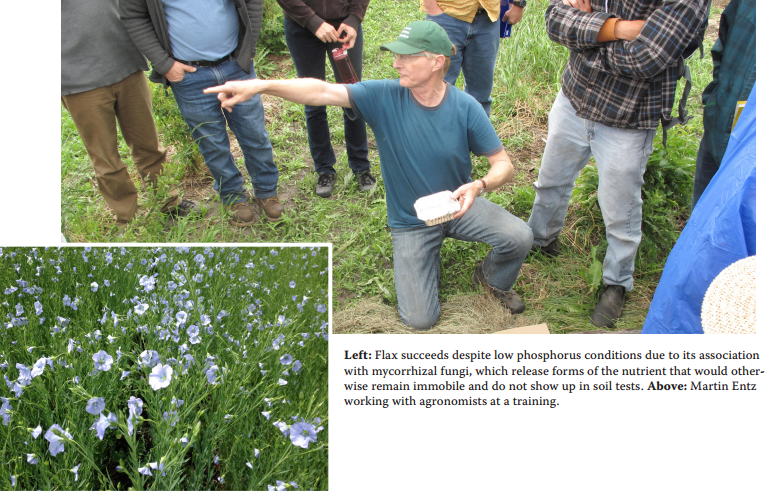 Flax, for instance, succeeds despite low phosphorus conditions due to its association with mycorrhizal fungi, which release forms of the nutrient that would otherwise remain immobile. “And that’s phosphorus that won’t show up in soil tests,” Thiessen Martens notes. In the assay, above ground plant samples are cut, the material is dried and weighed, and tissue nutrient concentrations are analyzed. To get the best read on possible deficiencies, the assay is conducted on the legume green manure in the rotation. This way, plants are freed from nitrogen limitation and more subject to other nutrient limitations in the soil. The validity of those thresholds is now being tested on farms. With support from the Prairie Organic Grain Initiative and the Organic Farming Research Foundation, a pilot group of roughly 10 agronomists is using the tool to help 32 organic farmers make soil fertility decisions. On the one hand, Thiessen Martens hopes to save producers the trouble and expense of adding inputs to their fields before they truly need to. “It seems there is room to operate at a lower level of nutrients” on organic farms, she says, because of factors such as good crop rotations and well functioning soil biology. On the other hand, she adds, “we want to help farmers realize that this isn’t possible to do forever.” That is, soil nutrient levels will drop at some point to levels too low to support crop growth. Entz agrees, noting that organic farmers sometimes believe that if they simply add a green manure, the soil biology will take care of itself and all their nutrient problems will go away. “Well, that hasn’t happened…at least with the farmers we know,” he says.